Core Training For MMA Excellence! Core training is one of the most important training requirements for athletes. Learn more about these training workouts for MMA fighters. They will have trouble executing the power necessary to wear their opponent down. As the fight progresses, their ability to continue striking with ferocity, while maintaining a stable foundation will deteriorate. Their ability to work the clinch to secure dominance on the ground will suffer. Standing from a hold or reversing an opponents advantage from the ground will be next to impossible. Why? Because the core dictates our ability to balance our bodies while maintaining a lower, stronger center of gravity, which enables us to use leg power to leverage and strike (both punching and kicking) effectively. Any fighter will know that their stance in any particular hold or strike determines the effectiveness of that move. A Strong Core Is An Essential Requirement For Any Fighter. The hips, waist and lower back are all responsible for the power generated throughout any combative movement: very few fighters will last the distance if they do not possess a strong core region as power, speed, flexibility endurance and skill (components that should be developed to their fullest in any good fighter) can all be enhanced through strength in this area. When we aim to generate speed during a punch, for example, we rely on a powerful twist of the waist and good flexibility in this area. Likewise, maintaining a reverse chokehold (read skill and power) will necessitate good lower back strength. Good abdominal development will assist with kicking power and endurance. In fact, developing a strong core is a major requirement for any sports-skills-based training program, as this will allow efficiency of movement from all directions. This is not to say that other muscle groups are to be overlooked, as, fundamentally, muscle-balance should be the objective of any program, but a strong emphasis should be placed on core strength for maximum sports performance. As mentioned, the core region, which is located at the center of the body, is responsible for allowing movement in all directions. 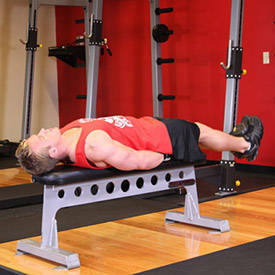 The synchronization of all the muscles associated with the lower back (the erectors) and waist (abdominal, serratus and oblique muscles) lends power to most of the movements we make, as they provide a muscular link between the upper and lower body and enable correct posture and consequently the stability and strength needed to perform at a sufficiently high level. A weak core will lead to a serious imbalance between upper and lower body and poor posture, all of which may negate performance and lead to injury. Mentioned earlier were the hip muscles - part of the core by virtue of their involvement in spinal movement. This complex grouping, comprised of external rotator, flexors, adductors, internal rotators, extensors and adductors plays a major role in core stability and movement. An MMA fighter will rely on their hips to a large extent during the twisting and anterior (tilting forward) and posterior (tilting back) rotation that is needed to properly execute any of the strikes or holds. Good hip strength and flexibility will, in fact, will add more power to your kick than anything else. Therefore, along with specific muscles of the waist and lower back, the hips should not be neglected. Core training is thought to be one of the single most important training requirements of benefit to both athletes and non-athletes. Benefits of core training for both the MMA fighter and the average person follow. The wear and tear an athlete incurs on their body will gradually weaken posture and stability if core training is de-emphasised. A strong core region will help to offset that most debilitating of problems: a weak back. With a stronger core, we can perform more efficiently and for longer. A strong core will enable us to move efficiently through a variety of different tasks. For the MMA fighter, the complexity of their art necessitates the strongest possible foundation. The wide-range of moves they need to make in any given fight requires versatility of movement far greater than perhaps any other sport. The core forms a shield around the kidneys and liver, protecting them from harm. The stronger the core, the greater the protection we receive. As any fighter will attest, a shot to the kidneys or liver can be most debilitating. When our core is strong, the heart and lymphatic system will circulate blood and lymph throughout the body more efficiently. The training needed to build a strong core actually changes the pressure in these muscles, which, in turn, causes enhanced circulation. The core muscles serve to straighten the spinal column, rib cage and pelvic girdle and, as a result, keep the body in its correct alignment. The head, arms and legs all have a stable working foundation if the core is sufficiently strong. Punching or kicking, for example, requires transference of weight from the upper to the lower body and vice versa. Only a strong core will allow this to occur with maximal power and speed. The following exercises all work well to develop the core as, in addition to strengthening the individual core muscles themselves, they force the body to work in an unstable environment. In fact, any exercise that causes the body to self-correct (to compensate for an unstable surface or weight imbalance) will assist core development. Position lower back in the center of the exercise ball. Lie back with hand behind the head. Crunch forward using the abs to pull the torso toward the upper legs. Hold contraction for one second before slowly returning to the start position. Hold dumbbell with right hand and place left hand behind head. Bend torso to the left side (facing away from the dumbbell). Complete 15 reps on each side; do not rest between sets. Hang from a chin-up bar with legs straight down. Raise knees to the chest. Stop as the legs reach waist level. Hold contraction for one second. Bend bottom leg at around 90 degrees while keeping top leg straight. Lift top leg so that toes are at shoulder level; hold for four seconds. Repeat 20 times; an equal number of reps for each side. As exercise become easier add in two-pound increments. Lie on Swiss ball face down with abs positioned in the middle of ball. Lower body forward with hands crossed over chest. Use lower back (erectors) to pull upper body back to starting position. Rest bar across shoulder as with a regular squat. Bend hips and lower torso forward until parallel with the floor. Raise torso until hips are extended. Sit on a Swiss ball while holding medicine ball (begin with 2lbs and progress up to 8lbs) with both hands. Holding ball close to body, twist upper torso, leading with the shoulders, to both the left and right (hips should stay rigid throughout). Repeat on each side, 20-25 times. A Swiss ball will allow for a greater range of motion and for constant tension to be kept on the working muscles, as it provides an unstable environment and supports the natural alignment of the body while forcing the body to adapt to unnatural positions (which promotes the recruitment of more stabilizing muscles to build a stronger core). As with all progressive resistance programs, training should be kept dynamic and, as such, weight should be added, or reps should be increased, wherever applicable. The following is a good core-training program that combines the previously mentioned exercises and can be used either at the end or beginning of a standard MMA training session. This program is to be used no more than twice a week to allow for full recovery between sessions (two to three days rest). For example, if regular training is four days a week, or even every day as would be the case the a pro level fighter, structure core sessions into every third workout. As explained, a strong core region will allow the MMA fighter to dominate the opposition through the many physical advantages such an asset will provide. Stability, strength, power, speed and flexibility throughout the lower back, abdominal region and hips will allow for effective weight transference, skill application and injury prevention. With all things being equal, a fighter with superior core strength will outlast and outperform one who is lacking in this area. Get to work on the programs provided and improve your core today!